Beach apartment, brand new and equipped. Apartment recently renovated with all amenities. Great views of the marina and the archaeological remains of 'illeta'. Direct access to the beach. Very quiet and separated from other buildings. The property consists of a daily doorman and a direct lift to the beach. By the orientation of this apartment it is ideal for sunbathing all year round. If you wish, you can hire Spanish classes adapted to their level. As the title says, the location of this apartment is just perfect, the views are incredible and access to the beach could not be easier. The owner is lovely, does not speak English but had an English speaker on hand to help and they were very nice to deal with. The apartment itself could do with a bit of updating in terms of the furniture, decor and amenities (beach chairs etc). These are minor issues though, the main problem is the air con, there is only one in the sitting room and it is old and if someone is in the sitting room with it on, then the beautiful balcony becomes unusable as it churns out hot air to whoever is sitting there. This was a big shame as my husband likes to sit for periods of time in the air con as he needs breaks from the heat and I like to spend my time on the balcony taking in the view but we could not do both at the same time! With just a little TLC and investment this could be a first rate apartment. Very clean. Everything provided . Writing this as we end our two week stay in this gorgeous apartment overlooking the sea, marina and beach. So impressed with this apartment and its owner Rosa. Everything is provided that could possibly be needed including a welcome bottle of wine! It would have been appreciated if an information leaflet on how the oven worked...very complicated and we never really worked it out! On the plus side Rosa provided a tram ticket fully loaded so we didn't have the hassle of getting one ourselves....you simply swipe it in the tram and your on your way! Will be definitely be paying a return trip next year as we've thoroughly enjoyed our stay and the weather was perfect! Muchas gracias por tu comentario, me alegra saber que disfrutásteis del vuestra estancia en mi apartamento. Estaré encantada de volveros a atender. Tengo en cuenta vuestra consideración y redactaremos un folleto de instrucciones. The apartment was very clean, tidy and well appointed. It consisted of one good sized bedroom with plenty storage space, a good sized shower room and a open plan kitchen-living area. The TV had Spanish only channels and there was also no DVD player... which were a small draw back for those days when the weather was less kind. Thankfully I'd brought a USB stick with movies that we could still watch.... but a DVD player would be a welcome addition to this property. On arrival we were met by Rosario and her daughter who both took the time to show us around the apartment and also showed us how to access the marina for the appartment lift. There was also a nice bottle of vino tinto to welcome us, which was a lovely touch. The apartment has a nice sized balcony with table, chairs and sunloungers. 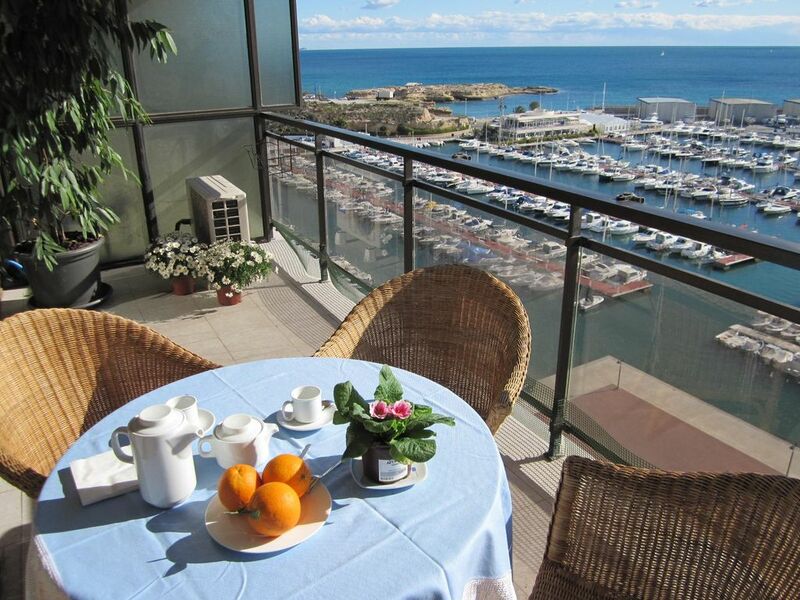 From the balcony there are spectacular views over the marina, whilst also giving a fantastic view over the whole of El Campello's beautiful 1 mile long beach. The appartment allows easy access to El Campello's beach, shops, restaurants and bars. If you fancy travelling a little further afield, the tram station is also a 10 min walk away... or you can download KabX which gives easy access to the local taxi company without the need to speak Spanish! We have spent many vacations in El Campello and the surrounding area, staying in a variety of properties and this was undoubtably one of our favourative locations for a short break. Thank you for sharing your appartment with us Rosario....We will DEFINITELY be back! Beautiful apartment in a lovely resort overlooking the Marina. Really didn't want to go home and will most definitely be booking again for next year. This apartment is in an excellent location on the 7th floor overlooking the Harbour; with great views of the Beach and the Mediterranean from the large balcony. The Sun shines on the balcony from first thing in the morning until around 14:00 (During our stay in April). The apartment has everything you would expect for a short stay. The town is perfect with many restaurants and bars, the prices are cheaper away from the beach front. We were welcomed by Rosa and Jaime, who were very friendly and helpful, with advice on places to visit. We hired a car, but it’s not required for the location. I would recommend this apartment, and we would certainly rent it again. There is free parking on the beach front, but beware of the people directing you where to park, as they are not officials, and are trying to give the impression they are parking attendants. Just walk away after you park and they won’t bother you. The parking is also free on the main road next to the apartment block. Thank you very much for your opinion, I'm so happy with your stayed and I hope to serve you again. We really love the location and like you write, the sun shines on the balcony and also inside the apartment, enjoying the greats views. The apartment is on the 7th floor of a residential block - 2 lifts area available and one of them opens straight on to the waterfront. The apartment is well equipped and very comfortable and ideally located - everything you need is within walking distance - plenty of bars and restaurants and shops within a few minutes walk - no need to hire a car. El Campello is on the tram route which is easy to use and runs regularly between Alicante and Bendiorm as well as further up the coast. The views from the balcony are spectacular - always something going on, whether its boats coming or going from the marina, the fishermen selling their catch or people playing boules on the beach - we never tired of the view. In summary - a great apartment, well located, well equipped and a great place to relax and unwind. The apartment is located in Campello, typical Mediterranean town, located on the beach and fishing port. El Campello is a quiet town that offers all kinds of services for tourists, is well connected with nearby cities such as Alicante or Benidorm via road, motorway and tram. In your environment you can enjoy the sea, the mountains, knowing the history through archaeological sites and museums and enjoy delicious dishes of Mediterranean cuisine. You can choose to swim in long beaches of white sand or hidden coves with clear water or discover the seabed in rocky areas. If you love hiking you can go on excursions along the coast discovering each watchtowers which served to protect coastal populations, bird watching in the wetlands and salt or discover the fragrance of Mediterranean flora in the nearby mountains, Maigmo, Cabeçó d 'Or or Aitana 1558 m. altitude. The history of the Costa Blanca from the Paleolithic, Neolithic and Bronze Age, Iberians, Carthaginians, Romans and Arabs. Intact traditional villages of farmers and fishermen are still preserved, with all its authentic flavor, old customs, festivals and kindness, with its typical houses and narrow streets. The new Archaeological Museum of Alicante is very interesting from the educational point of view, yet fun, rigorous and spectacular. The Tossal of Manises is the site of the Roman city of Lucentum, ancient Alicante. Located in El Campello. Despite its small size, this site is of great importance for its cultural sequence. - Castillo de Santa Barbara. In the ninth century are the Muslims, decided to settle where today the Castle. The city is further developed their feet protected by the strength. - Wells Garrigós. Intended to save the scarce rainfall in wells by Muslims. Built building on the wall of S. XVIII going around Alicante. The museum used as exhibition space Gravina Palace, eighteenth century building that belonged to the Earl of Lumiares and hosted the Provincial Archives. - Basilica of Santa Maria: this basilica was originally a Muslim mosque, whose remains can be visited inside. It is the oldest civil building in the city is preserved. Its rooms house an important collection of art of the twentieth century, mainly composed of works donated by Eusebio Sempere. Also includes works by Chillida, Picasso, Dali and Miro among others. - City Hall. The first building of the City of Alicante is built upon receiving the title of city in 1490, awarded by Ferdinand. - Home Theater. Opened in 1847, this is the quintessential theatrical exhibition. - Esplanade: The walk runs along the maritime zone of Alicante. - Casa Carbonell, one of the main buildings of the city. - Municipal Park. Is part of the palm grove of Elche, declared World Heritage Site. - Tower of Calahorra. It is an Almohad tower of the late twelfth and early thirteenth. - Altamira Palace. late eleventh and early twelfth century, houses the Museum of Archaeology and History of the city. - Basilica of Santa Maria. It is located in the place that occupied the main Muslim era mosque. - City Hall. La Torre del Consell, served his way through the Plaça de Baix, outside the walls, and the market already within the walled vila. It is the only inhabited island of Valencia. It housed in the past a refuge of pirates. The walls surrounding the town have been declared a Historical and Cultural Interest. Its waters have been declared a Mediterranean Marine Reserve. From the church square you can see the whole region. From there they stepped down cobbled streets and whitewashed houses that run between. They are common in this traditional urban space, artists' studios and craft shops. El Castell de Guadalest, which existed in the Muslim period. This declared historic - artistic. If you need additional information regarding a specific activity, the development of tourist itineraries based on your preferences or to accompany him on tours contact us. Estancias de menos de una semana, tienen incremento de precio. Consultar con el propietario. Disponemos de precios especiales para puentes y festivos no incluidos en la tarifas habituales. Contactar con el propietario en estos casos.